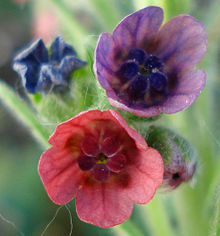 Cynoglossum officinale (hoondstongue, hoondstuith, dug's tongue, gypsy flouer, an rats an mice due tae its smell) is a herbaceous plant o the faimily Boraginaceae, foond in maist pairts o Europe, an an aa North Americae whaur it wis accidentally introduced. ↑ "Cynoglossum officinale". Integrated Taxonomic Information System. ↑ "Invasive Species: Houndstongue". United States National Agricultural Library. This page wis last eeditit on 9 September 2013, at 23:41.